Saturday was our first opportunity to stop and take a breath after a few consecutive days of nonstop interviews and note-taking. Fausti treated us to another scrumptious meal of toast and veggie omelets before we all hopped into the Hulk and headed for Cape Coast. The 30 minute drive to the beach was reminiscent of California… and I don’t even live there. The palm trees lining the coast screamed everything about L.A. We’d all take turns sticking our heads out the window while the Hulk zoomed down the highway at 200 mph. Man.. the Northeast really pales in comparison to this place, and staying here longer and longer makes me realize this more and more. Cape Coast truly is a place unlike any other. We had been there before, but each trip there reveals something new about its novelty. The tight, narrow, dirt roads are lined with endless shops selling purses, designer shirts, cell-phones, snails, etc. On top of that, there are thousands of vendors walking around with ginormous bowls of water bottles, candy, and other goods on their heads. It’s nearly impossible to squeeze the Hulk through the narrow openings. The entire market is also a maze of swerving roads that cut in and out of each other. Hopefully, the pictures that we upload will do some justice to what it’s like to actually stand there. We stopped at a literal hole-in-the-wall Internet cafe. For the first time, we all had simultaneous access to decent Internet speed. Of course, it was all business. We wouldn’t dare waste time checking our inboxes for emails that ominously reminded us of our impending return to school, or checking our Facebooks to make sure our loved ones hadn’t forgotten about us. Instead we worked our butts off during that hour to keep this blog beautiful and informative for all of y’all reading. Then it was finally off to the beach!!!! This beach literally looked like something out of a Windows desktop background. The turquoise ocean water and bright yellow sand were preceded by hunching palm trees overlooking the coast. We found a nice little table with chairs underneath a huge tree for some good shade. We got everything we needed from a typical beach day. Swimming in the water (well, at least those of us who were brave enough to do so, including Jiwon in full clothing LOL), INTENSE beach volleyball (Isaac doesn’t get to be competitive very often, so he took this opportunity to fully unleash his rage… our team motto became “SHOW THEM!”), and good beach food. We satisfied our Western appetites with things like sandwiches and hamburgers, which tasted good despite waiting for the longest time for the meals to come out. It was already getting dark, and we hopped into the Hulk to head home. We stopped by the refugee camp and bought some more orgasmic Ivorian bread fresh out of the oven. We indulge ourselves waaaaaay too much. It’s all good, we know we’re fat. The rest of the night involved even more winding down. We sat around the couches in the common room gobbling down the loaves of bread with cheese, and had a very late dinner of pasta with tomato sauce prepared by Fausti. The rest of the night was a blur of card games (Speed, Spoons, Bullsh**, Chinese Bullsh**, etc…) and jumping from one non-sequitur topic to another. I could really get used to this. I <3 Ghana. Speaking of “I <3 Ghana”, you should all see Clarey’s batik cloth. 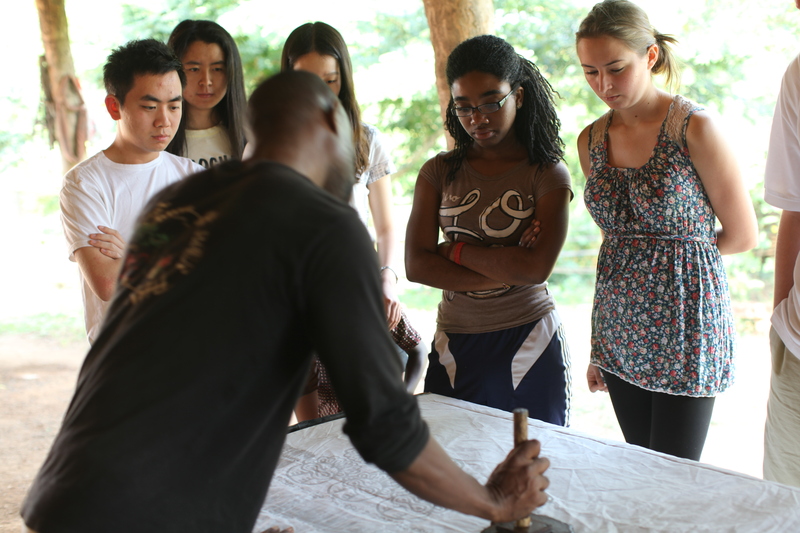 Sunday morning was definitely the day for creative expression, and for those of us who are artistically challenged beyond repair, we were happy to hear the words of our Batik teacher, Kokroko. Kokroko is Yaw’s brother and before we began to work on our cloths, he gave us a very inspiring message that linked beauty directly to the eyes of the creator, there was no other route. With this new confidence to produce a beautiful print, we all took turns on about two metres of cloth and created various designs with Adinkra symbols, shapes, letters and patterns. By the end of the day there was a long line of purple, orange, yellow, red and green cloths drying out. Still in the creativity mode, we moved on in the late afternoon to help Isaac re-plaster a mud oven that we would eventually slide in some pizza pies, as promised by Isaac. This weekend was very relaxing and by the looks of all we had accomplished, well deserved. We enjoyed every moment but were starting to wonder how we would be coerced to leave when the time comes.